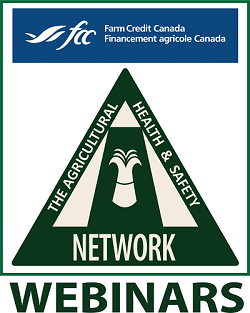 The Network has partnered with Farm Credit Canada to present a four part webinar series on Health & Safety. Topics delivered in 2018: (1) Stress: Mental Health & Farming (link below); (2) Rollover Prevention Strategies (link below). The third one "Save your Breath: Respiratory Health & Safety" will be on Tuesday January 29, 2019 at 1:30. Please see poster below. The fourth "A Good Night's Sleep: Sleep & Agriculture" will be delivered in February. Date to be announced soon. Please contact Tess.kelly@usask.ca if you want to be notified when they are posted. Thank you Farm Credit Canada for funding this project! Join us on Tuesday January 29, 2019 at 1:30pm.